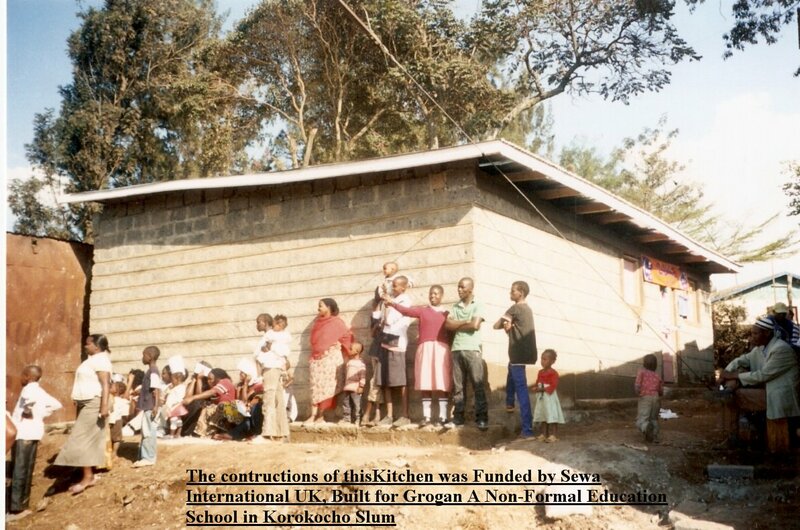 In Nairobi, we have funded a kitchen in Gorgan School in the Korkocho slum. Below are some photographs and a report by Princess Anu Dave. 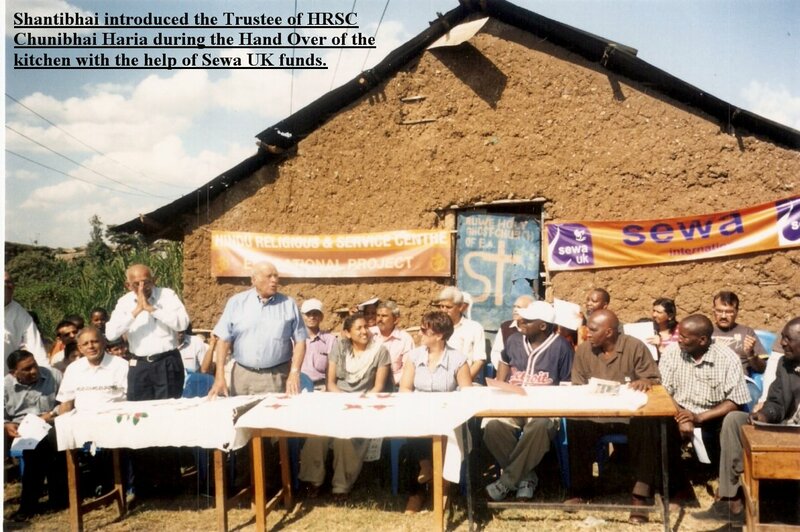 AT GROGAN ‘A’ SCHOOL IN KOROGOCHO ON SUNDAY 26th SEPTEMBER 2010. Members of the Hindu Religious & Service Centre were patiently waiting at Deendayal Bhavan on Sunday 26th September 2010 for the City Hoppa Bus to take all of us to the venue in Korokocho. Although, delayed due to the heavy traffic of Nairobi ,the enthusiasm did not die at all; in this case, I would like to thank everyone who supported this project with all the patience in the scorching heat. As we reached the venue Grogan ‘A’ School, we were welcomed by Mrs. Osnet Keidar, Mr. Peter Nyangosa, The Headteacher Mr. Joesph Mwangi and others We were taken to the place were the function was to be held. The programme started by the Christian and Hindu Prayers and after introductions by the School Headteacher, APHRC and Sewa team, the chief Mr. Mungoya Losagu welcomed us all to Korokocho. He is the New chief in that area having served at Westlands before. He told us how challenging it was to build the kitchen for the school, and he advised the community to look after the kitchen and maintain it properly. Before he concluded his remarks he sang a song NA SEMA ASANTE SANA, NA SEMA ASANTE SANA, E MUNGU WANGU. The Headteacher Mr. Joseph Mwangi gave a brief of the school. 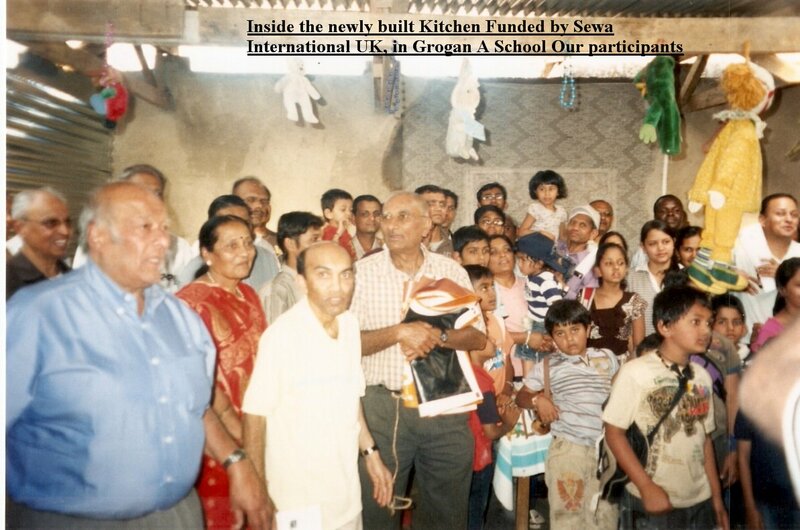 Grogan ‘A’ school was established in 1992 with support from Action Aid. The main aim then was to give a chance to overage childrens acquire literacy and numeric skills. 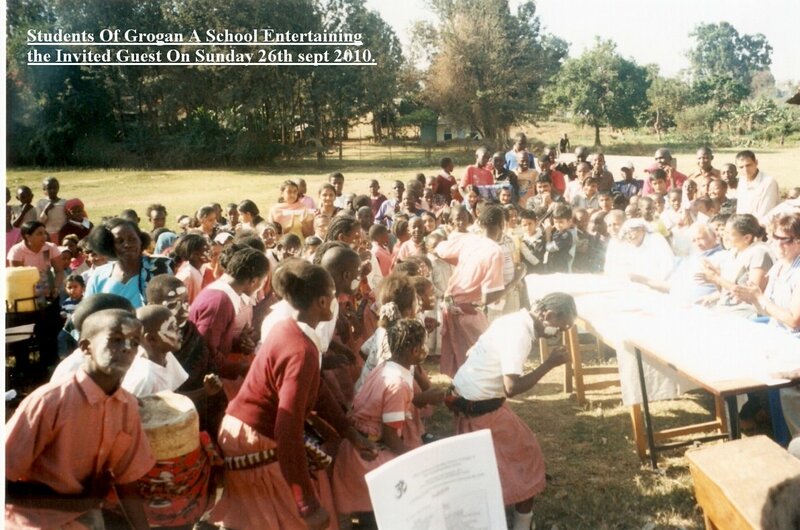 The main objectives being: To rehabilitate orphaned, destitute, and vulnerable Childrens in the area. He wishes to introduce regular feeding programme so as to maintain the pupils in the school, to eradicate illiteracy by giving pupils education. He wants to start apprentice courses for those who would not make it to secondary school. This is a community project meant to benefit the residents of Grogan ‘A’ village and who shall own, run and shoulder the responsibility of sustaining it. The school is run by a management committee; a 13 member body headed by a chairperson. 12 are elected and the 13th is the head teacher. Due to the high poverty levels, most parents are unable to contribute the monthly fee of 200/- Per pupil. The feeding programme that was started is on the verge of collapse as most parents are unable to contribute K Sh.10/- per day, towards its sustenance – buying of food, cooking oil, charcoal and other needs. We also have numerous problems- Lack of enough funds to buy learning and sitting materials, problems facing the general community like malnutrition, sickness, poverty and illiteracy, high school drop-outs due to hunger and other domestic problems. We have 7 teachers and 3 support staff. The enrolment of the pupils is 242—125 girls and 117 boys. 60% of The pupils come from single parent households, 16% of the pupils are total orphans There are nine classrooms. 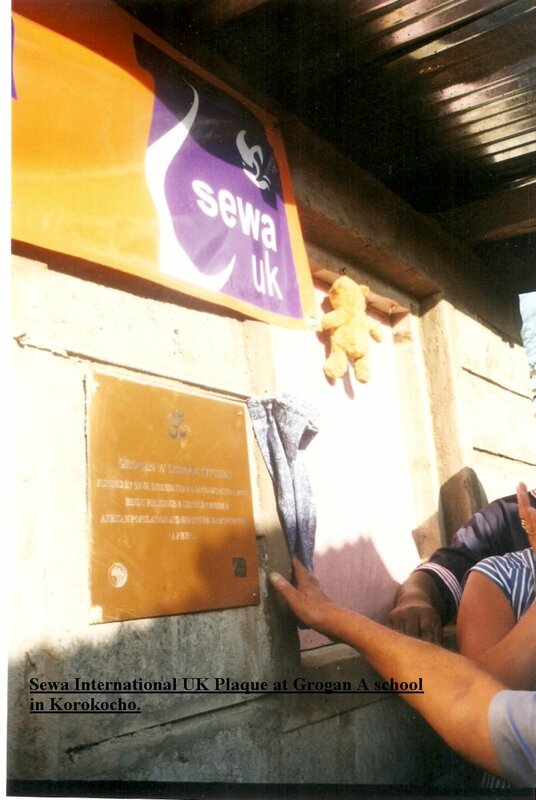 We aim to achieve greatness in all areas including its core activity ,that is academic success and with The help of SEWA INTERNATIONAL UK and others who have helped us from time to time ( courtesy of Mrs. Osnet) we will succeed. Mrs. Osnet Keidar who works tirelessly to maintain eleven schools in that area brought forward the issues that they face., being an informal school. An informal school is one that has not been recognized by the government, meaning that the children do not get the benefits of free primary education., text books. They have only one per classroom. 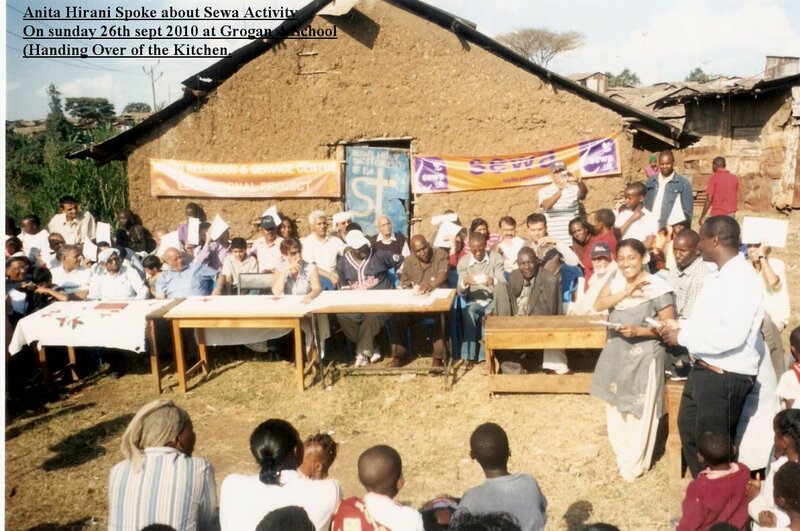 Although she told that she collaborates with UN Habitat and others to bring good standards. The students then presented two very lively songs in praise of God and those that help the school. ,especially Mrs. Osnet and Sewa International. On Sundays. 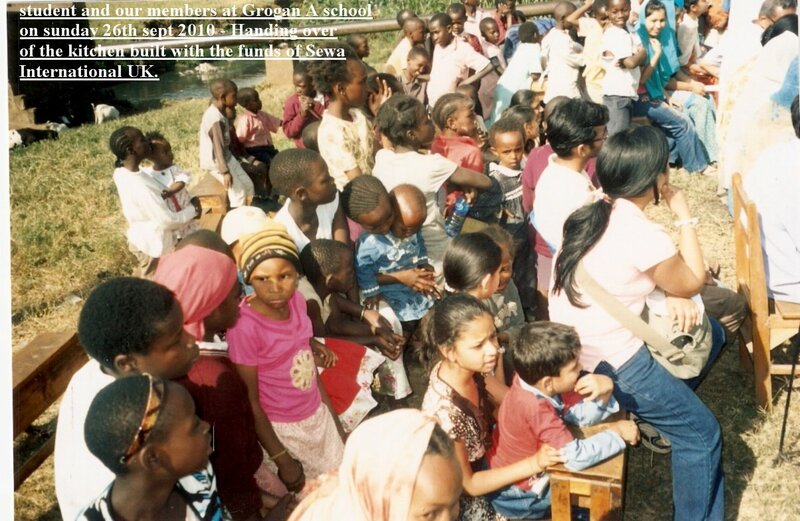 One of our associates, Shri Sita Ram Parivar has been feeding about 1500 childrens at Runda for the past 22 years. 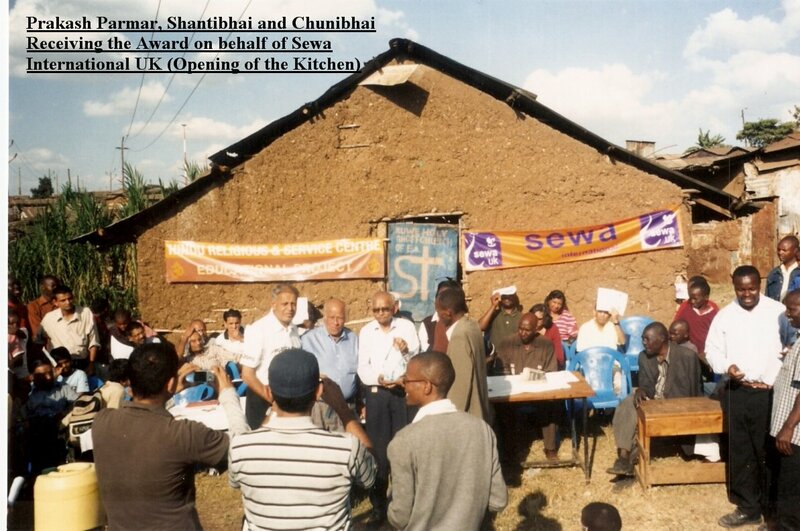 Mr. Isaac Adan Chairman of the Board thanked everyone for participating and especially SEWA UK for having Constructed the kitchen, where we will start a regular feeding programme. 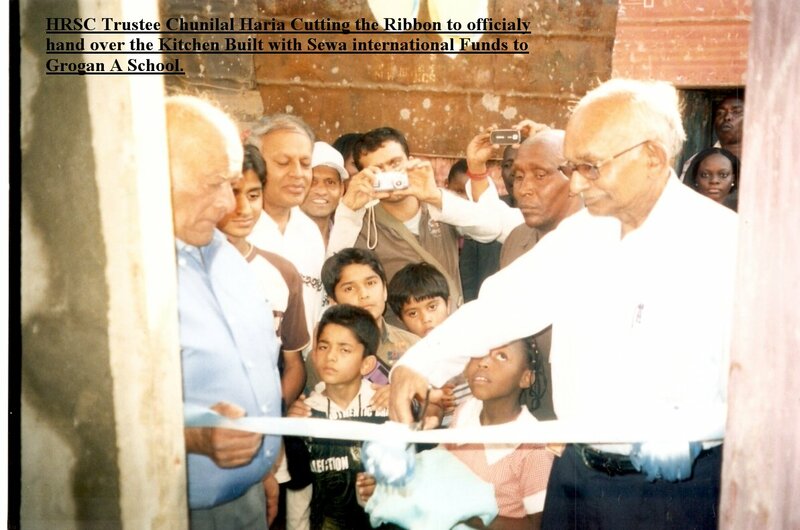 The unveiling of the plaque was performed by Shantibhai Shah – Sewa Pramukh and the ribbon to the Newly constructed kitchen was done by Shri Chunibhai Haria . After Vote of thanks and prayers we all Departed with a satisfaction that something good has been accomplished. As for me and other sevikas though a bit hesitant to join, Anitaji convinced us all to go to Korokocho Kitchen opening. She had convinced us by promising that it’s going to be a worthwhile experience, and true to say, it indeed was!! I kindly pledge to all to take part in this type of imitative to make KENYA a better place and to raise the literacy levels.